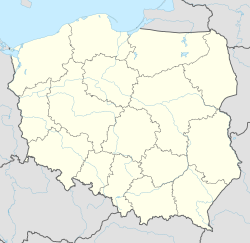 Nysa [ˈnɨsa] ( listen) (German: Neisse or Neiße) is a town in southwestern Poland on the Eastern Neisse (Nysa Kłodzka) river, situated in the Opole Voivodeship. 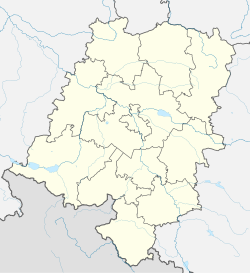 With 44,419 inhabitants (2016), it is the capital of Nysa County. It comprises the urban portion of the surrounding Gmina Nysa. 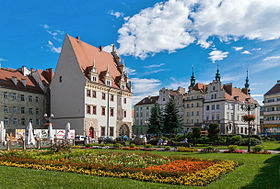 Historically the town was part of Upper Silesia. Nysa is one of the oldest towns in Silesia. It was probably founded in the 10th century and afterwards became the capital of a principality of its name, which around 1200 became part of the Bishopric of Wrocław as the Duchy of Nysa. According to German sources, the town was founded around 1223 by bishop Lorenz close to a slavic settlement, attracting German settlers. The town's fortifications from 1350 served to defend against the Hussites in 1424. 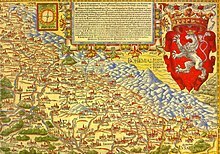 The town and the duchy was part of Lands of the Bohemian Crown in years 1342 - 1742. 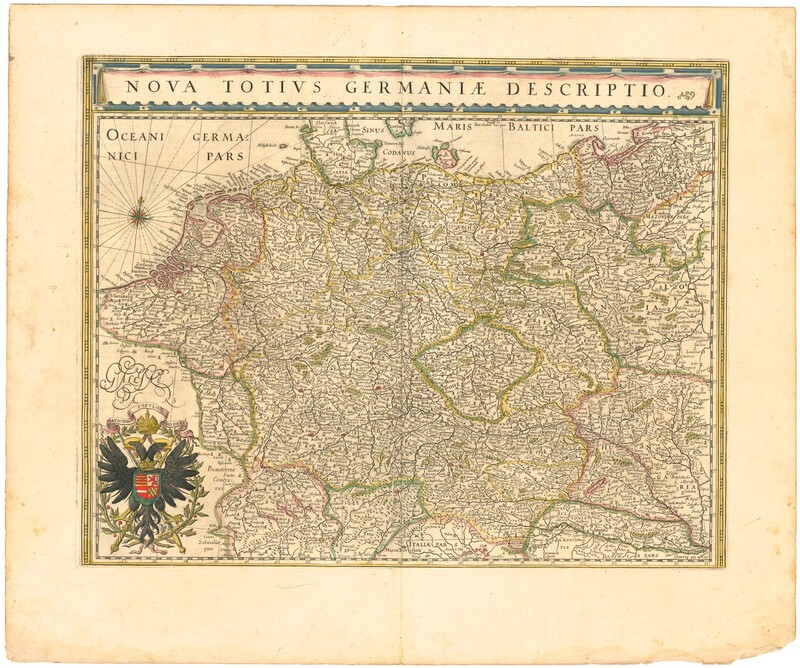 One of the prominent signs that Nysa was a significant center, is the report in Nuremberg Chronicle, published in 1493, which mentions the city among the major urban centers of Central and Eastern Europe. In the description of the town population included in this chronicle we read "plebs rustica polonici ydeomatis ...". Other evidence is Nysa coat of arms at the entrance of the Charles Bridge in Prague, which is displayed alongside the arms of the most prominent Czech cities. During the Thirty Years' War (1618–1648) it was besieged three times. The First Silesian War (1740–41, War of the Austrian Succession) ended Austrian sovereignty over Silesia and left the town in the hands of King Frederick II of Prussia, who laid the foundations of its modern fortifications. On 25 August 1769 Neisse was the site of a meeting between Frederick II and Emperor Joseph II, co-regent in the Habsburg Monarchy of Austria. During the Napoleonic Wars, Neisse was taken by the French in 1807. It retained its mostly Catholic character within the predominantly Protestant province of Silesia in the Kingdom of Prussia. Because of its many churches from the Gothic and Baroque periods the town was nicknamed "the Silesian Rome". From 1816-1911, the town was the seat of the Neisse District, after which it became an independent city. After World War I, Neisse became part of the new Province of Upper Silesia. Conquered by the Red Army during World War II, the town was placed under Polish administration according to the Potsdam Agreement and renamed to the Polish Nysa. The town's German population was largely evacuated or forcibly expelled and replaced with Poles, many of whom were themselves expelled or resettled from what is now Western Ukraine (see: Kresy). As a result of destruction during World War II, in particular the heavy fighting of the Vistula–Oder Offensive of early 1945, during which the Red Army pushed the German Army Group A out of southwest Poland, the historic aspect of the town has only partially been preserved. The most important monuments have been rebuilt. A list of the monuments of Nysa is seen on the page Nysa's monuments. 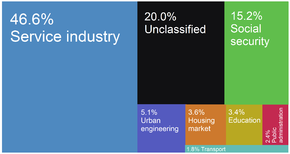 Nysa city budget income sources as of 2015. Until recently, Nysa was a major industrial centre in the Opole Voivodeship. The town was home to metal works, machinery production, agricultural produce and construction materials. The year 2002 saw the closure of the van company ZSD. The company constructed delivery vehicles, namely the ZSD Nysa, FSO Polonez and, until recently, the Citroën C15 and Berlingo. Currently, the factory remains closed. Recently, the Wałbrzych Special Economic Zone is located by Dubois Street (ul. Dubois) and Krapacka Street (ul. Krapacka), largely revolving around agricultural goods and produce, as well as metal works. NKS Nysa - men's volleyball team playing in Polish Volleyball League (Polska Liga Siatkówki, PLS), 7th place in 2003/04 season. KŻ Nysa - sailing club with seat on Nysa's lake. Wikimedia Commons has media related to Nysa. ^ "Home - WSSE Invest-Park. Wałbrzyska Specjalna Strefa Ekonomiczna Invest-Park". WSSE Invest-Park. Wałbrzyska Specjalna Strefa Ekonomiczna Invest-Park. Retrieved 30 January 2017. ^ "Nysa » mapy, nieruchomości, GUS, szkoły, kody pocztowe, wynagrodzenie, bezrobocie, zarobki, edukacja, tabele". www.polskawliczbach.pl (in Polish). Retrieved 30 January 2017.